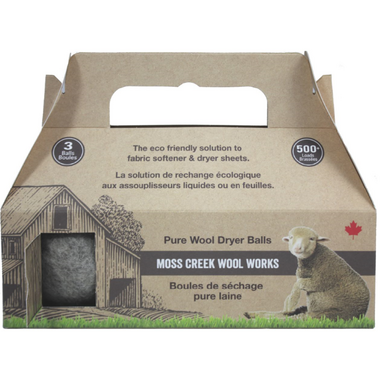 Hand Made in Canada, Moss Creek Wool Works Dryer Balls are a nifty invention that will save you time and money! Love the product, love that I'm using less dryer sheets! Less chemicals for my family and better for the environment. There's a bit of static on some items, but for the small amount of static it's worth it for doing something better for my family. I LOVE these. I have two sets. They significantly cut down on the drying time, particularly when I throw 6 of them in with the laundry. They don't seem to help with static electricity, but the description on Well also doesn't say that they would. I love that you can toss them in compost or green-bin when they've reached the end of their lifespan. 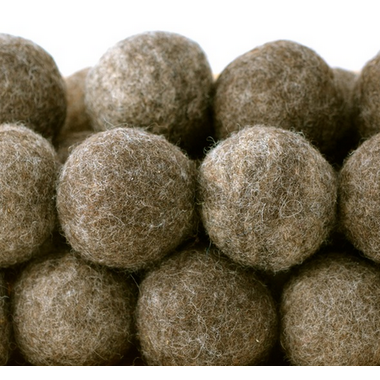 I love these wool balls, they have reduced static in everything I dry in the dryer. I also found they softened my towels beautifully. I love the idea that I am no longer clogging up the filter in my dryer. They do prevent static, but I have not seen a big difference in drying time for now. Love them! The time to dry is shorter and help with the static! Exactly what I needed. Helps clothes dry much faster! Work well in the dryer. Nice option to use essential oil on them for scent. Like the product. Bought for baby laundry, helps with static and love them with grapefruit oil or sweet orange. Great product that really does help soften clothes, reduce static and drying time. I add a couple drops of essential oil to softly scent the load. I can't use chemical softeners so these are perfect. Great product! Love that it's all natural and handcrafted. It does pill easily though so have to be careful with little kids. But it isn't a big deal. Better than chemicals anyway! I would recommend and buy this again. It lasts a decent time too! Wow, much better results than I ever expected. I am telling everyone about these, especially moms who want to reduce the amount of chemicals that come into contact with their children. I decided to try these on a whim when the were on sale. I have never used fabric softener, so at first I didn't notice much of a difference. After using them for a few weeks I feel like my clothes come out fluffier and with fewer wrinkles. Also cuts the drying time down by about 5 minutes. They went on sale again so ordered a set for my mother in law. I love this product, especially for drying my baby's clothes. I love these!! They make my clothes soft and static free. Loving these dryer balls so far! My clothes always come out static free and soft. Very pleased with this product that I just ordered some more! No problem with static and great for those who are fragrance sensitive. I'm loving this product. I feel good about using it, it does seem to help with drying time and everything is nice and soft. Only con I have is they don't seem to reduce the static. So far they seem great. Fewer wrinkles (they somewhat beat the clothes. Still get some static. You really have to take out synthetics before they overdry. Great product, no static, no gross synthetic fragrance. Great product! Just one per load keeps clothes and towels soft. It also saves on drying time and seems to help with static. I bought the white ones, which are no longer available on here (at the time of this review, at least). I've used them with all types of laundry (light, dark, jeans, other clothes, sheets, towels), and there hasn't been any shedding. Excellent product that really works. I like that they are made in Canada. I have tried the other balls from Nepal and the wool was much coarser than these.